They promised to put CCTV cameras in buses but where are all those CCTV cameras? Their promises were just words and have not been implemented. Things haven’t changed in India, Asha Devi said. 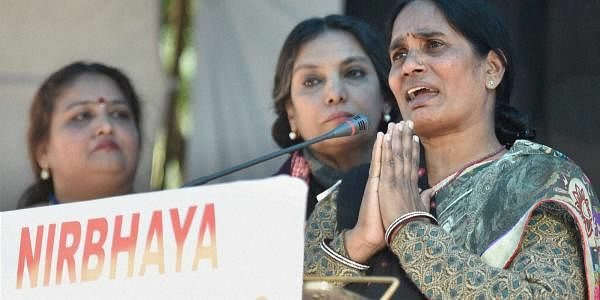 NEW DELHI: Awaiting justice, Nirbhaya’s mother said on Saturday that even after five years the culprits are alive. It was on this day in December 2012, when six people gangraped Nirbhaya, a 23-year-old physiotherapy intern, in a moving bus. “Even after five years, her (Nirbhaya) culprits are alive. If justice isn't served on time, people cease to be scared of law. A strong law needs to be formulated and mindset of everyone, be it a politician or a common man, needs to be changed,” said Asha Devi, mother of Nirbhaya. She said that her family is still standing at 2012. “They promised to put CCTV cameras in buses but where are all those CCTV cameras? Their promises were just words and have not been implemented. Things haven’t changed in India. Crime against women still continues and no one says anything,” she said. She added that even after requesting the government for justice no action has been taken yet. “I haven’t asked or begged in front of anybody for any favours. I haven’t asked for job for my husband or any other family member. I always ask other for justice. This case was pending in the Supreme Court for the past two years,” said Devi. Asha further emphasised the fact that no action has been taken on women safety in India. She also said that priority should be given to women safety and security. Nirbhaya succumbed to her injuries in a Singapore hospital on December 29, 2012. One of the accused, Ram Singh, had hanged himself in the prison, while another person, who was a juvenile at the time of the crime, was convicted in August last year and will serve the maximum sentence of three years in a reform home.